Supporters of Nnamdi Kanu – UK’s pro-Biafra Leader – have set up a government petition for Nnamdi Kanu. The petition currently has 918 signatures and will be run until July 2017. If he gathers 10,000 signatures, the government will respond and if 100,000 signatures, the petition will be considered for debate in Parliament. Nnamdi is currently in prison in Nigeria where he has been locked up by the Department of Security Services since October 2015. 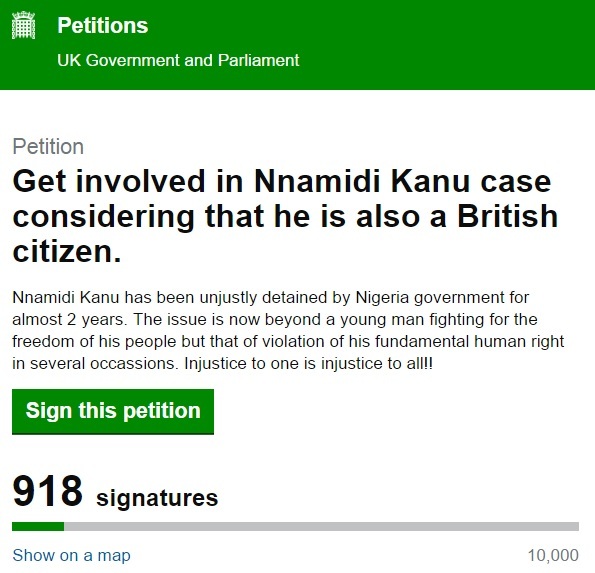 UK Nigerian Pro-biafra nigerianuk, sign the petition for Nnamdi Kanu Bookmark the permalink.